KingPlease press "SEND A MESSAGE" located underneath "Request a Booking" if you wish to book the property. 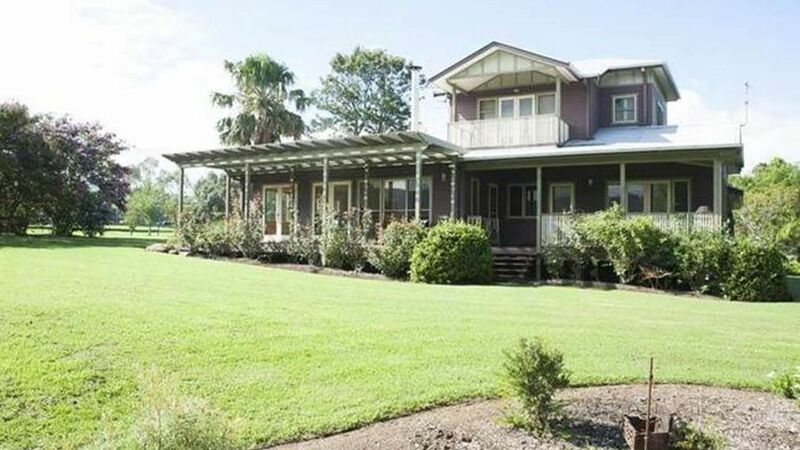 The Millet House is a luxury self-contained farm house set on the historic property "Melross" in Kangaroo Valley. Situated on 240 acres, Melross is widely considered one of Kangaroo Valley's most beautiful properties. Breathtaking views from the house look out across the hills into the spectacular cliff escarpment that surrounds the entire property. There are so many ways to enjoy your break at The Millet House on Melross - take long walks around the property and down to the river, wander down the country lane to collect some freshly-laid eggs from the chickens, lounge by the swimming pool and enjoy a fresh Espresso Coffee machine, create a feast on the barbeque and enjoy your meal with a glass of local wine, cuddle up by the open fireplace, or just sit back and watch the animals graze and soak up the stunning views from the verandah. There's nothing better than a home-cooked dinner enjoyed outside on the deck gazing at the perfect valley stars. However they choose to spend their time all our guests at Melross say the same thing: we never want to leave! Only 5 minutes drive and you are in the charming township of Kangaroo Valley, which features the lively Friendly Inn and a select choice of cafes and restaurants. Please note that there is a 2 Night Minimum Stay. You will instantly fall in love with The Millet House on Melross. The architect-designed and interior-decorated house has featured in House & Garden magazine and was also the photographic location for the Margaret Fulton Cookbook. The Millet House has two levels. The top level features one bedroom with a King-sized bed, ensuite with spa bath, and balcony overlooking the beautiful property. The downstairs level features three bedrooms - two with queen size beds *one of these rooms has a single fold out bed ) and one with a double bunk bed (double base, single top) - as well as two bathrooms. We also have a porta cot & Highchair for guests with a baby. The house is perfect for families or a weekend away with friends. For those who enjoy their cooking, the well-equipped, air-conditioned kitchen, including a Aldi Espressi machine. Also featured within this part of the house is a lovely, light-filled dining area and lounge with open fire. The house also features a separate, heated lounge area and LED television. Another feature of the Millet House is its generous balconies and verandahs, perfect for home-cooked meals overlooking the stunning Valley. There is also a 10-metre swimming pool. The pool may be heated with additional costs. At Melross you will feel as though you have the world to yourself, yet you are only a 5-minute drive or a 25-minute walk from the town where you can enjoy browsing the shops and watching the world go by in one of the charming cafes. If you're feeling active, the Valley features a golf course, horse riding trails, tennis courts and canoe hire. Further afield, you can enjoy the township of Berry (only 1/2 hour away) and the scenic beauty of Jervis Bay where you may be lucky enough to spot a dolphin! In the other direction, you can enjoy the majestic falls and two scenic bushwalks at the Fitzroy Falls national park (15 minutes drive). Beautiful house with amazing views. We thoroughly enjoyed our stay recently for my 60th birthday with family. It is in a great location, with plenty of grass for the kids and dog to run around on. We loved sitting at the outdoor table playing board games and eating our meal. A couple of things i would recommend tho are: bring your own bottled water and in summer aeroogaurd is a must. Cheers. The millet house was a beautiful family country home. The view was breathtaking. A fantastic modern house with amazing views to the ocean. Comfortable for 8-10 adults, enough room for privacy and to bring everyone together for a meal. Location is amazing, only a ten min walk to the shops or the beach. What a beautiful place! We absolutely loved our weekend stay, the house had everything, ample space for 4 couples and 2 babies, beautiful rooms, a swimming pool with a view and a stunning property to explore. Thank you for providing the perfect location to celebrate a 30th birthday.